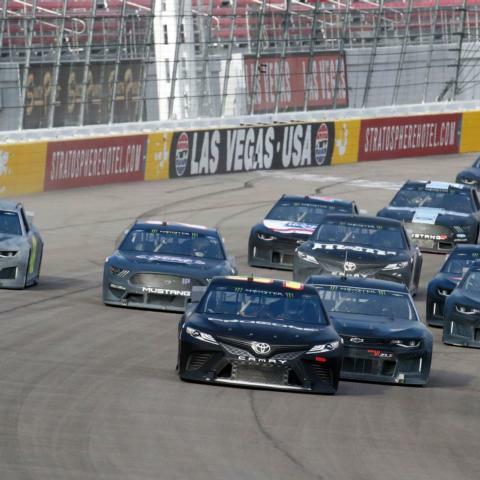 Las Vegas Motor Speedway was buzzing with the sound of horsepower on Thursday as 21 drivers spent 10 hours testing NASCAR's new ground-breaking aero package for the 2019 Monster Energy NASCAR Cup Series season. Drivers logged dozens of laps - both individually and drafting in packs - throughout the daylong session. It was a chance for drivers to feel how the cars handled with the new body styles, which are designed to foster closer racing, as well as for teams to gather valuable data and work out any kinks heading into the new racing campaign. This week's test is considered by many in racing as one of the most important sessions in NASCAR history, and LVMS was honored to host the significant event. 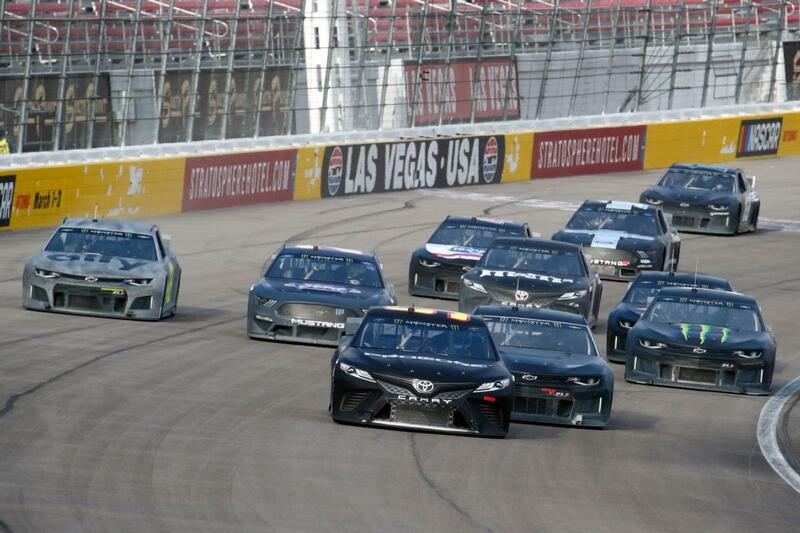 "The new race package is a NASCAR game changer," LVMS President Chris Powell said. "The maneuvers we saw today blew everyone away. Drivers were racing, at times, four-wide into the turns. It was racing like we've never seen on a mile-and-a-half and truly was awe-inspiring. Having a full field of 40 cars racing like this will make for a newfound excitement. Race day can't get here quickly enough." "We really appreciate NASCAR and (Executive Vice President and Chief Racing Development Officer) Steve O'Donnell for choosing Las Vegas Motor Speedway as the site for a test of this magnitude. Their efforts are indicative of the industry's dedication to making the sport better, and we can't wait to see this new racing package on display in Las Vegas for our March 3 Pennzoil 400." Clint Bowyer, a two-time MENCS race winner last year, was one of a handful of drivers who met with the media during the lunch break and was clear about who he feels the 2019 changes will benefit most. "There's really only one voice that matters, it's the fans," said Bowyer, driver of the No. 14 Stewart-Haas Racing Ford. "That's the voice we're all working for, and that's no different than it's ever been. It doesn't matter what sport it is, it's about the fans showing up and enjoying what they see. "The entertainment value of our sport has always been great, and this is a step to try and make it even better." Las Vegas's Kyle Busch had a prediction about how the new package will affect racing at LVMS and similar 1.5-mile tracks. "I think the competition is going to be closer together than what we've seen in years past, and I don't know if you'll see a lead guy be able to stretch it out five, six or seven seconds," said Busch, the 2015 MENSCS champion. "It's going to be a lot more of a mental game and will be more of a chess match, thinking how you're going to make moves, how daring you're going to be in making some of those moves and how hard of a time the guy you're trying to pass is going to give you back. We'll see how it's all going to play out, but overall, it's going to be interesting." John Probst, NASCAR's vice president of Innovation and Racing Development, said the sport's governing body was pleased with the first day of testing in Las Vegas. "I feel pretty good so far with what we saw out there," Probst said. "We feel like things went pretty well today, but by no means are we high-fiving and declaring any kind of victory. We know we've got a lot of work to do, and we'll continue to do that in a cooperative manner with the rest of the industry. "I would just encourage fans who might be on the fence or don't think they're going to like (the new package) to give it a try, because I think they're going to be pleasantly surprised by what they see on the race track." Probst said the new package is part of an evolution of NASCAR's fleet that began in the past and will continue in the future. "This has been a process we started years ago in the Xfinity Series, and we've had a lot of folks involved in this process from the beginning," Probst said. "We feel pretty confident because we did have so much engagement from the teams and had the engineers involved from the beginning. Our industry has a lot of smart people, and we have utilized all of them, and so I feel confident in the collective skill set in what we've put forth. "We are trying to set ourselves up for down the road and have a longer-term vision in play here that's moving us to the next generation of race car." Busch's older brother, Kurt, was happy to be back in his hometown and excited to get some seat time with his new team, Chip Ganassi Racing's No. 1 Chevrolet. "We've got a big hybrid group from Ganassi Racing here trying to collect data and work on this new package," said Kurt Busch, who won his Cup title in 2004. "We're just getting up to speed, as far as our communication and the little checklist items. Matt McCall's a great crew chief, and we've got everybody here from our engineering team, even from Kyle Larson's team and his crew chief, Chad Johnston. "This new package is as radically different as when we switched to the 'Car of Tomorrow' back in 2008. That's how much of a dramatic adjustment it is." Drivers hit speeds in the 178-mile-per-hour range, with seven-time NASCAR Cup Series Champion Jimmie Johnson topping the Day 1 speed chart at 178.885 mph. Kurt Busch owns the LVMS track record of 196.328 mph set in 2016. The 14 MENCS drivers at this week's test ran three 25-lap group sessions to see how the cars handled in packs around the 23-year-old banked oval. They practiced making passes, drafting and even ran four-wide heading into Turn 1 at one point. Austin Dillon, the reigning Daytona 500 champion, said cars featuring the new package remind him of one of NASCAR's other series. "It really reminded me of my truck (series) days, and I always felt like the trucks always raced really well," Dillon said. "Restarts are going to be really aggressive, and I thought we stayed together pretty good. We've still got a lot to learn and still haven't hit the balance we'd like in a race car, but it showed some pretty good speed. "I'm pleased with it and am having fun." The two-day test, which is free to the public, continues Friday at 8 a.m. Pacific Time and will run until noon. Food and beverages will be available for purchase in the grandstands, and fans also have access to pit road via the underground tunnel.